For many centuries, the Coelius Maior (Celio Maggiore) remained a hill almost completely uninhabited. Flocks grazed here among the orchards and vineyards. 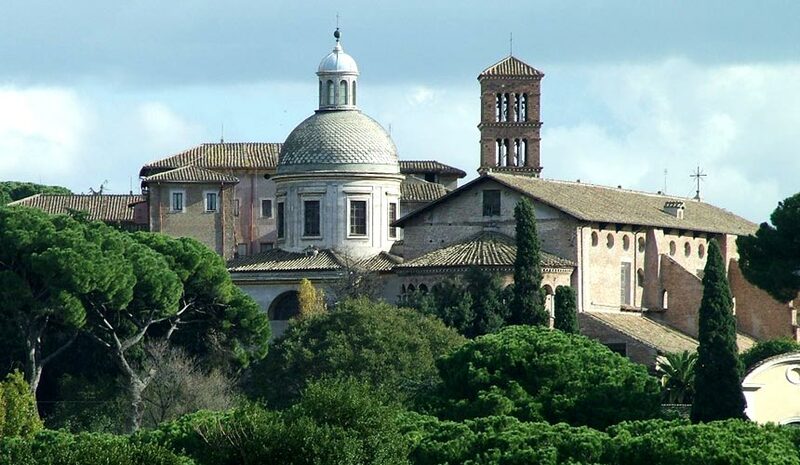 On this ancient hill to the left of the ancient Clivo di Scauro, the basilica was built above the house of the brothers John and Paul, very influential court officers, who were martyred for the Christian faith on 26 June 362, at the time of Julian the Apostate (+ 363). This area is unique in the history of Roman archaeology. There are traces of primitive Christian worship together with other obvious vestiges of prior art. After the murder of the brothers, other Christian martyrs there were buried here– Crispo, Crispiniano and Benedetta. The veneration of the holy martyrs of the celimontana came to fruition at the end of the 4th century in the construction of a building ad corpora by the Senator Bizanzio. Then the son of Senator Pammachius (+ 410c. ), a friend of St. Jerome, transformed the building into the form of a Basilica magna et valde formosa (large and lovely) as stated in the Itinerary of Salisbury. It was plundered and ruined at the time of the Visigoths in 410, and in the VI and VII centuries it was very frequented by many pious pilgrims. It was also furnished with numerous adornments. The names of the military martyrs were placed in the Roman Canon of the Mass. In Rome there were two other churches named after the martyrs of the Celimontana. One of these was on the Janiculum Hill. The other, with its annexed monastery was built by St. Leo the Great ca. 440, in the area currently occupied by the transept of Saints Martinian and Processo in St. Peter’s Basilica. Two priests, Proclinus and Ursus, had the title of the Basilica during the pontificate of Pope Innocent I (+ 417). Four priests, two of the title of Bizanzio and two of the title of Pammachius, were present at the Roman Synod of 499. 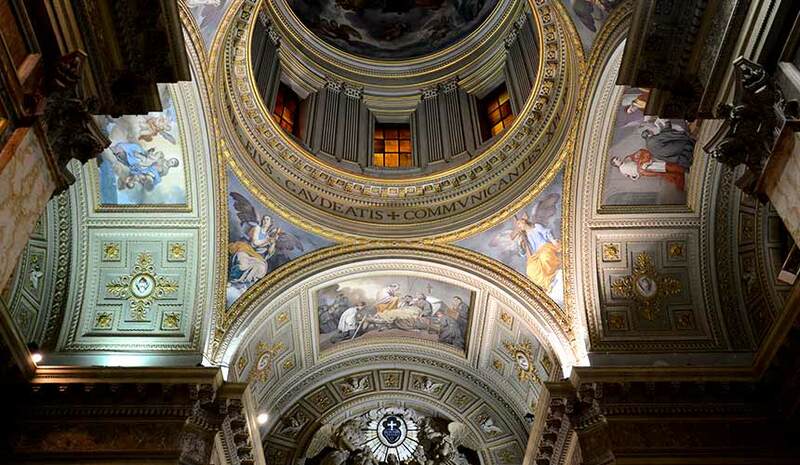 According to the catalogue of Peter Mallio, drawn up under the pontificate of Pope Alexander III (+ 1181), the title, at that time, was connected to the basilica di Saint Lawrence Outside the Walls and its priests would take turns celebrating Mass here. The Church was restored several times. Pope Symmachus in the 5th century and then Leo III occupied it. The cult of the celimontana martyrs spread throughout the whole of the Church. A Lector, a certain Massimino, who died in 567 at the age of 20, ministered in this basilica. For centuries liturgical services were provided by a small community of canons (or monks) until the year 1000. After the damage caused by the Normans of Robert Guiscard a restoration of the basilica and the monastery was ordered by its titular, Cardinal Theobald, at the time of Pope Paschal II (+ 1118). Besides the wear of time, several earthquakes caused significant damage. In addition, the Ionic portico supported by eight columns with Ionic capitals, dating back to the 12th century (built to replace the old narthex), as well as the apse were completed by Cardinal Giovanni dei Conti di Sutri (1216) and by Adrian IV. The bell tower was built in 1115. Another important and profound renovation took place in 1718 (by the Architects Antonio Canevari and Giovanni Andrea Garagni, from Piedmont), transforming the interior of the basilica to its current form. 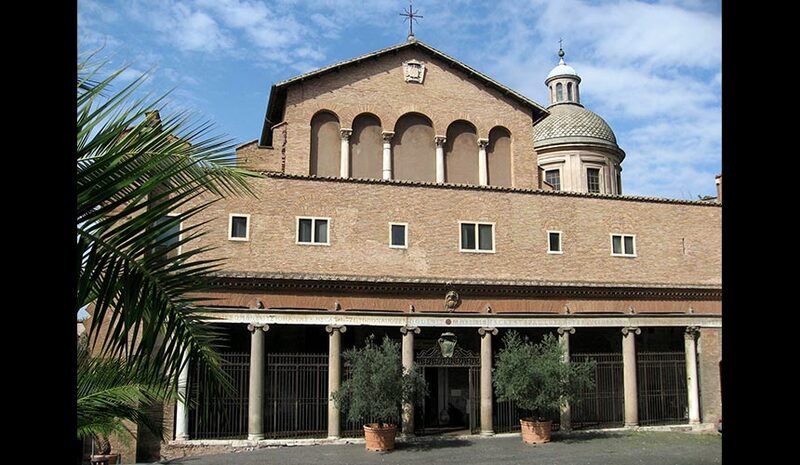 It was commissioned by Cardinal Fabrizio Paolucci (+ 1719) and changed completely the “open”, very bright appearance of the Paleo-Christian basilica. It was a transformation that was begun by Cardinal Philip Howard in the previous century. The interior of the basilica is large and majestic, divided into three naves by columns and pillars. The floor is Cosmatesque. A few meters from the entrance, in the nave, a marble slab recalls the underground location of the martyrdom. The relics of the holy martyrs are buried beneath the high altar in an urn of porphyry. On the right aisle a sumptuous chapel was built in the second half of the 1800’s to house the relics of Saint Paul of the Cross (+ 1775). Along the side aisles are various funeral monuments. In the left aisle, behind the altar of the Blessed Sacrament, there are frescoes dating from the 12th century. Finally in the early 1950’s, thanks to the great generosity of the titular Francis Cardinal Spellman, Archbishop of New York (+ 1967), the facade of the old basilica and monastery were restored to their former glory. The underground complex of the restored Roman houses can be visited through the entrance at the height of the old oratory of the Most Holy Savior, along the Clivo di Scauro.